With the announcement of his own feature film, now is a great time to take a good look at the character of Wade Wilson, better known as as Marvel Comics’ Deadpool. Long a cult favorite among comic fans, this odd and bizarre character is finally beginning to break into the mainstream. Operating as a mercenary, Deadpool is an extremely skilled, extremely talented, and extremely unstable danger to both others and himself. Despite the fact that he kills for a living, Deadpool frequently finds himself fighting alongside Marvel’s superheroes on the side of good, though not necessarily by choice. For those who aren’t familiar with the Merc With A Mouth, here are the top ten reasons why Deadpool is the ultimate anti-hero. Every great anti-hero needs an origin shrouded in mystery. Taking a cue from Wolverine, Deadpool is unable to remember his past. 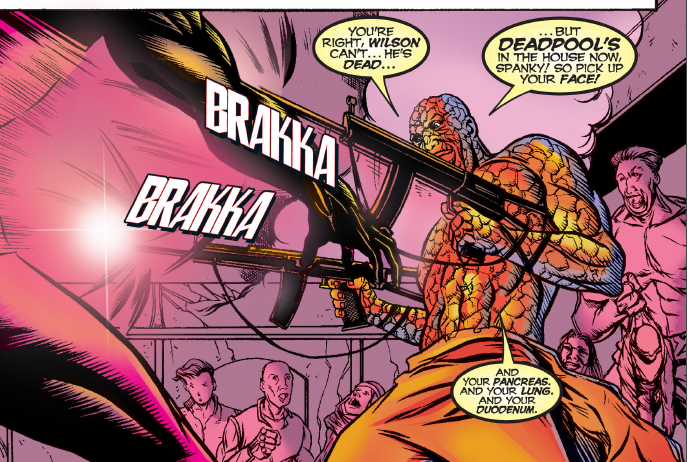 Even his civilian identity (Wade Wilson) is suspect, as he has been accused by his arch-nemesis, T-Ray, as having stolen it. It seems that every time he seems close to discovering his past, new revelations knock him back to square one. There is, however, one thing that seems to be consistent throughout all of his various proposed origins: again, just like Wolverine, Deadpool comes from the northern land of Canada. What is it exactly with Canada and amnesiac killers? In addition to his excellent combat skills, Deadpool’s greatest asset as a mercenary is his extraordinary regenerative healing factor, bestowed upon him by the Weapon X program. One would think that the ability to recover from almost any kind of injury would be a definite plus. However, this healing factor accidentally accelerated the growth of cancerous tumors all over his body. As a result, he is horrifically disfigured and gruesome to behold. This is one of the main reasons why he wears a costume that covers his entire body. Additionally, this healing factor messes with his brain cells, causing his mental instabilities to become even more pronounced and unbalanced. And yet, despite all of these disabilities, Deadpool refuses to let them defeat him. That’s something we can all admire. Unlike many other brooding anti-heroes, Deadpool is one of the funniest comic book characters in history. One of his nicknames is the Merc With A Mouth, and he more than lives up to that reputation. He has a vast, seemingly endless supply of witty one-liners, sarcasm and non-sequitur observations. Being almost immortal also leads to Deadpool being a reliable source of physical, slapstick comedy. Throw in a chorus of voices inside his head, a bizarre fascination with chimichangas and Bea Arthur, and an almost suicidal lust for over-the-top ultra-violence, and you have pure comedic gold. Another one of the defining qualities that makes Deadpool so beloved among comic book fans is the fact that he seems to know that he is, quite literally, a comic book character. Frequently breaking the Fourth Wall by directly addressing the readers or making references to things like “the writer” or “issue re-caps,” Deadpool keeps audiences on their toes and his co-stars in a state of perpetual confusion. While the idea of characters breaking the Fourth Wall is becoming more prevalent lately, Deadpool gets the distinction of being one of the first to do so. Why do we love anti-heroes? Perhaps it has to do with the fact that they are allowed to bend and break the rules that guide more mainstream heroes. Could you imagine Spider-Man gunning down and slicing up an army of zombies in a haunted swamp? Could you imagine Captain America running up to Wolverine and yelling “Snikt me! Snikt me! Snikt me!” Yet Deadpool has done these things and so much more. When Deadpool first appeared, it was in the pages of New Mutants #98, where he was hired by the super-villain Mister Tolliver (later known as Genesis) to assault Cable, a mutant from another time and dimension, and the rest of the New Mutants. There really wasn’t any moral ambiguity to his character. He was just the villain. 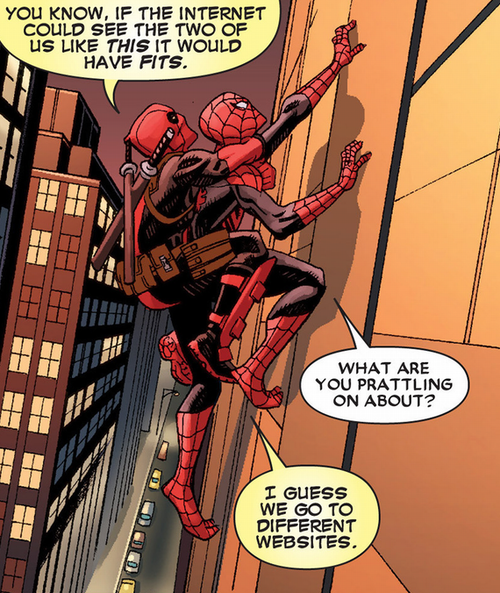 It was only after this that Deadpool began to become the anti-hero that we know and love. In essence, this evolution makes Deadpool a more fascinating character, both within Marvel canon, and from the perspective of his readers and writers. Yeah, yeah. Don’t tell him we said this, but deep down Deadpool does have a heart of gold. Beneath the jokes, the pointy weapons, and the adoration of blood and guts, Deadpool is a man who actually cares about others. He may have a ton of trouble showing it, but who can blame him? He does have a brain with roughly the same consistency as mashed potatoes, after all. 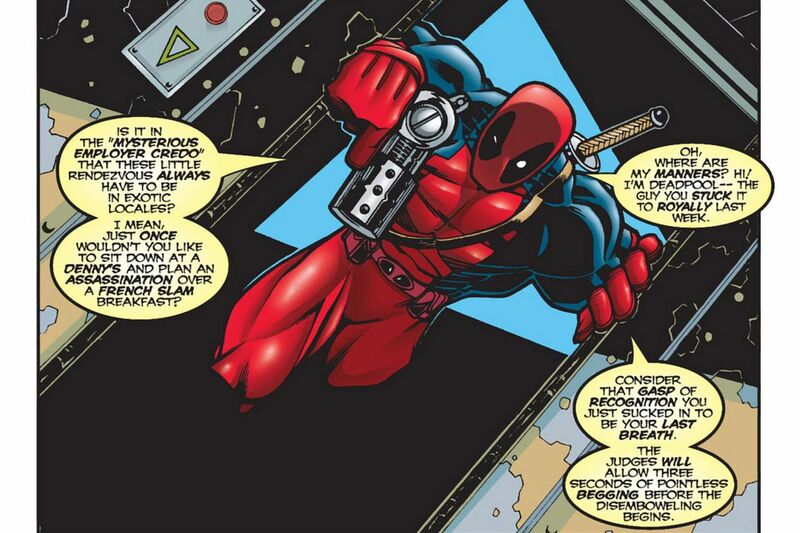 Most of our reasons why Deadpool is the ultimate anti-hero has to do with his actual characterization inside comics. But perhaps the most important thing about Deadpool is what he represents: one of the last vestiges of pure, unadulterated, unironic fun in superhero comics. In an age when comic companies are trying to make superheroes seem “tough,” “relevant” and “gritty,” Deadpool shuns these things and fully embraces the madcap insanity and joy that is the American comic book. Hopefully with his movie finally on the way, Deadpool will help remind the industry of when comics were fun and unafraid of bright colors, crazy action and escapist fantasy. On number seven are we sure about that? How long ago was She Hulk breaking fourth wall? It says ONE of the first, and he is definitely the most famous. Excellent article. 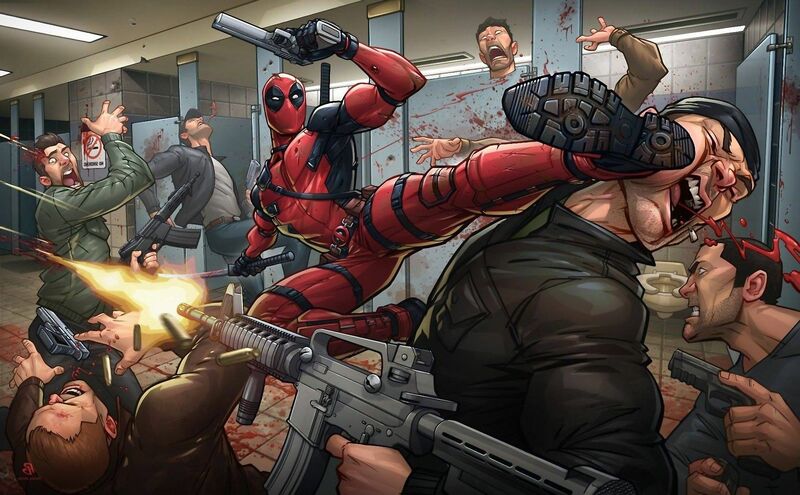 As a character, Deadpool is heavily undervalued even as he’s become more mainstream. I love Wade. I first saw him in some fan art with him making Spidey’s life miserable. So i did some research and BOOM instant fangirl. Best Marvel character EVER!!! !